It’s been an incredible summer for grapes. They love it hot and dry. There is much less disease this way. I got a hold of enough grapes to make two batches of jelly. I decided to do one traditional Sure-Jell Premium Fruit Pectin jelly and then for my second I tried Sure-Jell Pectin for Less or No Sugar Needed Recipe. 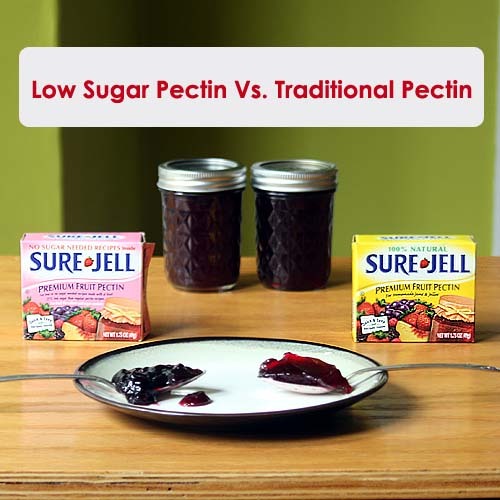 Now I can show you how the two types of pectin compare and whether or not the low sugar pectin is worth trying. I followed the recipes as exactly as I could in my home kitchen so that this could be a true side by side comparison. The methods for both recipes were almost identical. The only difference was adding a quarter cup of sugar in with the pectin packet to the cold juice for the low sugar pectin recipe instead of waiting for the juice to come to a full rolling boil to add all the sugar like you do in the traditional pectin recipe. From what I understand traditional pectin binds the acid of the fruit to the sugar which is why you need an exact amount of sugar while the low-sugar pectin binds to the calcium so the quantity of sugar doesn't matter as much. In fact, there is even a recipe in the box for substituting in Splenda™ if you are into that kind of thing. I hear stevia also works. Be careful if you have hard water there could be calcium in there and you could wind up with jelly that is too stiff when using the low sugar pectin. Also low sugar jelly must be processed in a boiling water canner or frozen for long term storage as sugar is a preservative and since there is less sugar the jelly will mold more easily. If I get out my calculator, that equals the low sugar grape recipe is about 1/3 the calories and sugar of the traditional recipe. Both jellies set up well. By looking I could tell the difference between a spoonful of one or the other. When I looked really close the traditional pectin set-up with slightly firmer edges and is lighter in color. The jellies do have slightly different flavors. Both of them are plenty sweet in my book. 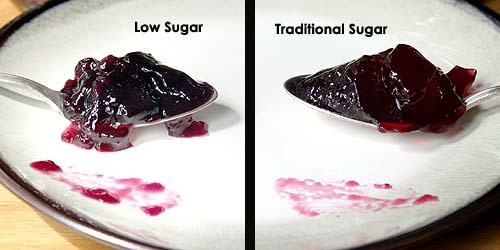 The low sugar jelly tastes more like grape juice, while the traditional pectin tastes like my grandma’s jelly. The low sugar reminds me of a grape Jell-o shot without the alcohol. Both are excellent. If I had to choose between the two, I would go for the Sure-Jell Pectin for Less or No Sugar Needed Recipe. I like that it has fewer calories and the purer grape flavor. My sister recently brought to my attention that jelly can be made with no added pectin at all. Simply use the fruit’s natural pectin to thicken the preserve by boiling down the juice. She’s been trying it out and says is not as fool proof as store bought pectin and it doesn’t gel as hard, but it works. It involves using a technique called sheeting to tell when it is done or a candy thermometer. The next time I make jelly I’ll have to give that a try. I know there are lots of other options out there to make jams and jellies. What do you use? hmmmm I skip all that sure jell nonsense and go straight to Pomona Pectin--it's SUPER cheap and you can use no or low sugar or make your own recipes up even--you can buy it in bulk and make pure fruit jelly and jam without paying for all that sugar or little boxes of sure jell--I like to see the comparison posts! We must have different grapes. My grapes did ok, but they are much smaller than they have been in years past. It's frustrating to me because I think they are already so much work. Make them smaller and it seems to double the work... ;-) But I will still make grape jelly. Next week. And I also prefer low sugar pectin. Here in Indiana the grapes are doing well. One of the few things that doesn't mind the drought weather. I've got Concords for the record. What do you have? I have grapes on my farm (Upstate NY), but they did AWFUL this year :( Sad news for me. Have you tried making your own natural pectin out of apples and lemon? I do this, and it sets jams/jellies perfectly w/o having to add sugar to bind it. Like @Laura said, Pomona's doesn't require sugar because is binds to the calcium. Pomona's must be the original Low Sugar Pectin! That's what this Sure-Jell stuff does too, binds to the calcium. It's probably way cheaper too. This was $2.99 a box on sale. I've been reading about making pectin out of crab apples or quince. I'll have to see if someone has a tree they will let me harvest! I hadn't heard about adding lemon. Although it makes since if pectin works by binding sugar and acid. an entire pound is 50 dollars and one ounce makes 4 batches of jam (4 cups of fruit) so it's pretty much AWESOME! I planted 3 grapevines (one Concord, one Merlot and one Chardonnay) in my backyard (in Colorado Springs, CO) about 10 years ago and the Concord is the only one to ever produce any grapes until this year! All 3 of them have grapes now. I'm very excited! I made grape jelly out of the Concords for the first time last year. Woah! I had enough grapes out of one vine to do 22 jelly jars of jelly and had a gallon of juice leftover that I just watered down and let my daughter drink. I made about 10 jars with the regular pectin and all the sugar. The pectin didn't set very well and the jelly is way too sweet. The rest of the jars I did with the low sugar pectin, half with no sweetener added at all and half with about 1 cup of Xylitol. Both worked out very well and everyone I've given them to prefers the jelly without any sweetener because Concord grapes are so sweet naturally. I also made some pepper jelly for holiday gifts and followed the recipe exactly, using the right amount of sugar and the regular pectin and it didn't set at all. I don't know what I'm doing wrong with the regular pectin, but I think I'll just stick with the low sugar stuff and experiment. Where can I buy the Pomona pectin in bulk? I just bought a box on Vitacost because it was really inexpensive compared to others, but they didn't have it in bulk. Anyone know if there's a place to buy cheese cloth in bulk? I used a ton last year and it was really expensive at the grocery store. 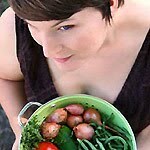 If you bought a pound of Pomona then you did buy in bulk when you consider 2 ounces is enough for one recipe! I didn't buy a pound. It was a 1 oz box. Pomona's Pectin is available in bulk at the Pomona Pectin website: www.pomonapectin.com. I have also tried this, most recently with muscadine jelly, and I found the low sugar to be so much more runny. It never seemed to set quite right. Great post and I will be bookmarking this one for future reference. Hope you are having a fabulous weekend and thank you so much for sharing with Full Plate Thursday. Great tips! I try cutting back on the sugar I use as well when I make jam. Thanks for linking up to Snacktime Saturday! Thanks for the side-by-side. I have made each type, but never at the same time, so I've never had a really objective comparison. 1) This year I had so much fruit that I purchased bulk pectin from Pacific Pectin (to find them, just Google "pacific pectin.") The initial cost is much more than buying a few boxes at the supermarket, but the cost per batch of jelly is waaaay less. They have regular and low sugar, and a zillion other varieties as well. I have a ton left over which I have put in the freezer for next year. It should last several years in the freezer. 2) Every time I do a no-pectin recipe I regret it. Somehow I keep forgetting that I regret it, and will get talked into doing it again. This year I did a lot of plum jam. The recipes I was looking at all talked about how much pectin there is in plums, so no added pectin is required. The problem is that a "job" that should have taken me a couple hours, took 2 days. To get it to work, you have to drive out much of the water from the fruit (plus any added liquid.) Further, you want to cook it low and slow so as not to burn the fruit, and you need to stir it so it wont scorch on the bottom. So, for 2 gallons of plums I was cooking and stirring for something like 6 hours (which I did over two days.) The end result was dark and thick and tasted more like unidentifiable-caramelized-fruit than like plums. So, I am not planning any more no-pectin preserves. If you do try it, I look forward to reading your impressions. PS: If you care to see my adventures with orange marmalade you can find it on my blog or via Punk Domestics. What an interesting comparison. I haven't made jam since I was little (I need to remedy that) but I've always wondered about Low Sugar Pectin. Thank you so much for sharing this with us at The Hearth and Soul Hop. I think both your grape jellies look absolutely scrumptious! Nice experiment! I was wanting to make grape jelly this year but I think I may have missed the window. I usually make jam without pectin, but on occasion I use it. And though I've only done it once, the other option is to use apple puree (really, just applesauce) to make "homemade pectin." You need a bit extra time to pre-make the applesauce, but it's neat to do--and I got a great yield (something I don't always get as I do the "boiling the juice down" method). I know that this is a year old but I wanted to address the question above about where to get cheesecloth in bulk. Go to any fabric store! They sell it by the yard (45" wide if memory serves. You can get the obnoxious loose-weave gauzy stuff that you have to use in multiple layers and doesn't wash well for reuse, or you can get the REAL original cheesecloth - unbleached cotton muslin. It usually costs under $2 per yard and you can use it over and over again, many many times. Wash it with a low-residue detergent and no fabric softener, dry it on hot and cut it into manageable size pieces (12" square is good for lining an average colander, 24"ish - half the fabric width - is better for hanging yogurt for cheese or fruit for jelly). I just used pinking shears to keep it from ravelling. Before each use dunk it in boiling water for a few minutes, let it cool and wring it out. If you feel like you have to use bleach,rinse at least twice. It will stain but so what. You will get many years' use out of it.